Weight Loss, Healthy Diet, Healthy Recipes, Nutrition and Fitness Expert: Energy Drinks: Help or Hype? We’ve all been there. It’s 3 PM, you are exhausted and fading fast. The tired monster had crept up and bitten you from behind. So what do you do? You could grab an energy drink for a needed boost, and why not? They claim to give you superhuman powers such as the ability to fly or the strength to pull oak trees from the ground if you only drink just one. You can find them everywhere from vending machines to mainstream grocery stores and supermarkets, and with over 600 different varieties, it’s hard not to find one you might like. Even Super Mario and Donkey Kong have their own energy drinks, and some drinks can come in containers as big as ½ gallon, WOW! So they can’t be that bad, right? Most provide 100% of your daily value of words you don’t even know how to pronounce and, oh look, they have more ingredients than the guest list for your wedding reception. Everyone’s drinking them, at the gym, at the office, even out at bars mixed with alcohol. So, what’s the buzz behind these “energy drinks?” Are they worth their expensive price tag or just another costly gimmick? The first thing to realize is that most of these energy drinks are made up of large amounts of sugar. This isn’t the natural sugar that you find in fruits, this is just plain old sugar. Sugar is a carbohydrate and when it is broken down in your body it can be used as energy, but this added sugar is not the ideal carbohydrate to optimally fuel your body. Since the majority of these cans are 16 ounces in size, the amount of sugar you can consume from just one of them is much more than you need and trust me, these cans aren't packing disease-fighting antioxidants found in real foods. Keep in mind, any excess calories from these carbohydrates will be stored as fat if they are not used for energy. In other words, these sugar laden drinks could be sabotaging weight loss efforts. Caffeine: The majority of energy drinks out there have a large amount of caffeine in them. Some have the same amount of caffeine as 1 cup of coffee, or two 12 oz. sodas, but others have as much as 3 cups of coffee or more. Caffeine is a stimulant and can be addictive since it is classified as a drug. People can react very differently to caffeine and the body adjusts to the amount it is given. This means you will rely on needing more and more to get the same “energetic” feeling caffeine can provide. Researchers have several different theories about how caffeine can work as an ergogenic aid during exercise and sports but a common one is that it makes you feel like you are not really working as hard as you actually are which is also called decreasing your perceived exertion. The downsides to consuming caffeine can be: an increase in heart rate, anxiety, jitteriness, and dehydration. 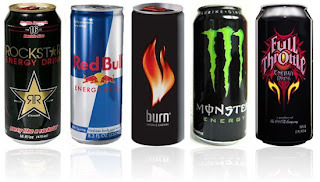 Check out the caffeine content in various energy drinks. when taurine is coupled with caffeine, heart rate increases and more blood is pumped from the heart. This is one of the reasons energy drinks can give you a heavy heart rate and jittery feeling. B Vitamins: Many energy drinks are fortified with 100% or more of your daily value of Vitamin B2, B3, B6, and B12. B Vitamins are involved in cell metabolism and help convert food to energy. Most B Vitamins can be acquired naturally in the diet and any excess is excreted from the body in urine. Guarana: Guarana is an herb and an additional source of caffeine. Many energy drinks include guarana in an “energy blend” along with many other ingredients. The downside to this is that the amounts of each ingredient added is unknown, and the combination of ingredients together may have unknown and potentially dangerous side effects. So, when it is all said and done energy drinks are basically an expensive waste of money. The amount of each ingredient added is unknown and some drinks contain ingredients not even labeled on the can. The combination of how these ingredients interact is also unknown and can be dangerous when consumed. With the addictive properties of caffeine, it is easy to go overboard and consume them in large amounts. This can especially be dangerous when coupled with alcohol, since alcohol is a depressant and can dehydrate your body. The best way to supply your body with the energy it needs is to spend your money on wholesome foods such as: fish, lean protein, whole grains, and plenty of fruits and vegetables, get adequate sleep each night, and stay properly hydrated throughout the day. You’ll provide your body with natural energy, not so called energy from energy drinks! Thanks for this article. I've wondered about these contents (Guarana and Taurine) for a while. It's good to know what they are and what they do. I'm curious about the Vitamin B shots like 5 hour energy. Though you touched on the Vitamin B some what about those? If you're B deficient, can these help? Water is still the best energy drink.